I think buying a $60-80 version on ebay to see what you think is a good idea. The two things I'd want to be sure about before I even spent that much would be that the putter actually had an 80* lie angle, and that the shaft was set back a bit from the front edge of the putter if possible. Most putters are around 71*, and more than 80* is not legal for play, so you don't want to spend any time at all with a putter that doesn't match up to the 80* standard. In the case of where the shaft inserts to the putter head, if it is flush with the front of the putter, it can interfere visually with the sight line to the back of the ball. I'd also want to ask what the loft of the putter was. The better ones only have 1* of loft, and much more than that would be a detriment, IMO. If you try this, commit and give it time. I'll say it for the umpteenth time, after 50+ years of putting conventionally; I have NO doubt that this is a simpler, better way to putt a golf ball. But it isn't a magic trick; you have to put the time in and learn ball position, grip, etc., and you have to not be bothered by other golfers freaking out when they first see you putt. And they will, believe me! Appreciate the info. I'll probably take a look and see if I can find something that fits that description. I'm 6'3" so I'll need something pretty long. At least I'll be able to buy something that will give me a general overview and feel for the method. Anyone have experience with this Bell putters company with some items on eBay? GP putter is designed so it can be held completely vertical even with the lie angle of 80* but I'm not sure that's legal. I've been told that putter can't be held at 90*. Don't know for a fact though. The GP Putter absolutely conforms. Anybody have experience/thoughts on those Bell putters? I've looked at them on ebay, but have never seen one up close and personal. The thing that would concern me about them would be that the shaft is more or less flush with the front of the putter face, which would (to me) interfere with my vision; that's not a problem with conventional putting, but it would mitigate the biggest advantage of face on, which is vision down the target line. 1. The guy that makes the GP putter provides a letter from the USGA that states that the putter IS conforming because the straight part of the shaft is at 80*. That said, the putter is designed to be held and used nearly vertically, which is for SURE in conflict with the rest of the rule. 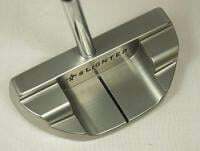 The GP was the first face on putter I tried, and I still have mine; the problem for me with that putter is that to make the head small enough to be used vertically, the head ends up being MUCH too light. I just wasn't able to have the sort of feel with the GP that I've had with either the JuanPutt or the Bobby Grace versions. 2. Apparently, Dechambeau's putter has been ruled in the last few days to be non-conforming, though the USGA hasn't said why. This doesn't surprise me, really; when I saw how he was holding the putter in that first tournament and then tried it for myself, I didn't see how he could do that without have the putter vertical at address. So I'm guessing (and it's only that) that the USGA has told him that he'll have to add more angle to the putter shaft, maybe even up to the 25 degree max in order to conform. That will be a deal-breaker for the way he's holding the putter, which might not be bad for him, OR for those of us that putt this way. The current way he's gripping the putter just seems so odd and so uncomfortable that it gets rid of some of the advantages of the method. I don't see how WHERE the shaft attaches could be it; it has to be about how vertical the putter is at address. FWIW, David Fay has been putting face on for a long, long time. Dechambeau's take that the USGA doesn't want him to putt that way seems premature at best; the rules for the putter are pretty clear and relatively simple. I just don't think there is any way for him to hold the putter the way he is without a head design that is on the border of being non-conforming. I wondered from the get-go. My guess would be the reason the are banning it is that if you turned the putter sideways and used one of the curved sides you could easily hold it at a 90* angle to the ground. I have talked with the USGA about a couple of designs and they mentioned this. DJ and Day both hit a 600 yard par 5 in two shots today with maybe 5 yards of total roll out...but yeah, Bryson's putter is what's testing the integrity of the game. Sure. I stopped joining the USGA after many, MANY years not when they made the groove rule, not when they made the anchoring ban, but when they gave the pros relief from greenside sprinkler heads in their line (not stance or swing) at frigging Pinehurst #2 that I don't get at the local goat ranch. I watch them **** up the course setup for the Open 2 years out of every 3, while the other three majors get it right EVERY year. There is one organization in the world for which I have less regard, and that's the NCAA. The USGA seems to me to be a bunch of guys who made some money (or inherited it, more likely) and don't know what they don't know. They make me tired. I have been putting face on for 10 years and I have tried all of them! I even spent a morning with Juan Elizondo putting with him before the LA Open. He really is the BEST! Face On putting changed the way I feel about the game. I had the yips and I was never happy after a round after missing a couple of 3 footers. I don't trust the USGA but to ban this because it is "Not in the spirit of the game" would be devastating. I still have them all! Thanks for the tip on Directed Force; I'll be looking for these! I agree with you about Juan Elizondo. When I made the switch to face on in the summer of 2015, I had a question about technique and emailed him. Long story short, he wanted to go out and try what I was talking about before he answered the question, and asked for a cell number where he could then reach me. I ended up having two LONG phone conversations with him; he could not have been more gracious and more interested or more helpful. We talked about the use of a line on the ball, an approach to learning most effectively, and even some personal stuff about illness in my family. It was remarkable, really. I've tried the GP, two different models of the Bobby Grace Let's Face It, and keep coming back to the JuanPutt. The head is just so solid and the roll is so good that it's hard to beat. I would also like to think that just MAYBE the USGA learned a lesson from the backlash against the anchoring ban, and will tread softly when it comes to making rules that not only are difficult to enforce, but counterproductive to participation and/or enjoyment of a game with serious demographic and economic issues anyway. Where are you hearing such things? There's no talk from the USGA about the face on putting stroke or the equipment. Nobody is saying that the usga is talking about banning it. It just seems like something they would try to do. Dave Pelz has even been quoted saying that if it gained enough popularity they would likely try to ban it. I agree with blue dot though. I think they would have a tough time. I too have tried several types of side saddle putters, including the bobby grace (don't like the shaft). I have settled on the Juanputt and think it is a great putter. Plus Juan is a great dude. But I never said that I was "hearing such things"; I was just responding to others who wondered. If you reread what I wrote, my take on it is that there isn't much way to write that rule anyway, even if the USGA wanted to. Whether they want to or not is something of which I have ZERO knowledge, and never claimed to. I didn't "facilitate" anything, rumors included. We were discussing the USGA ruling Dechambeau's putter as non-conforming with NO explanation of why And, it's not like the USGA is without history of making rules changes, including rules changes about putting in general, and face on putting in particular. Those aren't rumors; those are matters of fact, right? C'mon, bluedot. Call the USGA, or tremble under the covers. 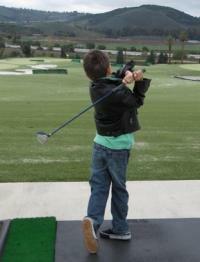 I know that even though I use a face on putter, I'm not afraid. If I thought for one second that the USGA/R&A was contemplating a new Rule about that, I would have emailed or phoned the USGA Rules office already. I've done so over Rules and equipment many times over the past fifteen years. Sometimes, when referencing rumors, they might say that they don't know and that's a better answer than sitting at home and stewing. Maybe you could go back and read the thread before you talk about me and the USGA; you have NO idea what you are talking about. I'm not the one that said that the USGA was thinking about a ban, that the USGA would ban face on, or anything of the sort, ever, in this thread or any other. In fact, I've consistently said that the USGA would NOT ban face on even IF they wanted to simply because writing such a rule create more problems than it would solve. Go back and read my posts; I think you'll find several to that effect, and NONE that say that I fear such a ban or am worried about it. As a matter of fact, I wouldn't be especially bothered by such a ban anyway; I putted well conventionally, and could go back to it happily; I just putt better face on. I decided to try it with a one-year commitment to see if I could just make a few more putts, which I do, so I've stayed with it. But I've been thru some things in the life of my family that have pretty much rendered me unafraid of much of anything, much less something having to do with golf. But I must say, I find your suggestion that an employee at the USGA would answer the phone, today or any other day, and be able to tell me all (or any) of what the USGA was talking about behind closed doors at the executive level laughable. If you didn't say what you said, then fair enough. Often, we find that straining to be clever prevents the very thing that we are trying to accomplish. You are indeed "sui generis". And that's a good thing. Still looking for a reasonably priced face on/side saddle putter to try out. I had a 38" Ping Ketsch that I played with last year and one day I just randomly started putting with a very open stance and split grip. I was pretty **** amazed how well it worked but it wasn't exactly built for that style. If anybody sees anything for sale or has a recommendation let me know. Thanks. The point I made originally is that I would have a real hard time if the USGA banned face on putting. With the history starting with Sam Snead then going to the anchor ban now the DeChambeau no explanation debacle it just seems very possible. I have been going through all of the questions and looks for years regarding the way I putt. Since I am different from the vast majority of putters, I always have that feeling it would be easy to eliminate such a small percentage of players for any reason they would like. I have always wanted a tour player to putt the way I do and as soon as this happened a controversy arose! At least now this is a forum I can get involved in and talk with like minds about. Thanks!